When Fiona and Finn's father, a psychologist, is killed in a car accident, the children and their mother (who is getting a degree in something "between philosophy, dance and making brushed wool dolls for preschoolers) have a hard time dealing with everything. One of the father's patients, a young man named Thomas, asks if he can call every Monday at 6:50 to give Finn a pleasant memory of his father. Also trying to help is Finn's neighbor, Luke, who suggests that they visit shelter dogs to read to them. Eventually, the family adopts a dog, Jenny. This helps a little, and the family slowly creates a new version of normal for themselves. Like MacLachlan's recent works (Jubilee, The Poets's Dog, Just Dance), this is a brief, poetic book with a simple and affecting story. The print is large, and the books seem perfect for classroom or betime read alouds by caring adults who can help young readers process the sadness in the lives of the characters. In this case, the book is a very personal one-- MacLachlan had a similar experience with a patient of her psychologist husband's who continues to talk to her after her husband's death. 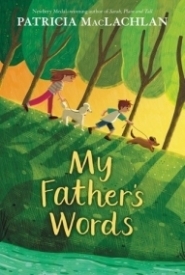 There's no shortage of middle grade literature dealing with the death of one or both parents, but this is a gentle book to address the younger end of the spectrum which might not be ready for longer books like Erica S. All Three Stooges, Stevens' The Heart and Mind of Frances Pauley or Gephart's Death by Toilet Paper.